Columbia and Legacy have been releasing complete catalogs of many artists over the last year or so, but few have been as big as the upcoming Johnny Cash: The Complete Columbia Album Collection. 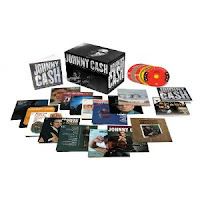 This new 63-CD set has every album released by Cash on Columbia from 1958's The Fabulous Johnny Cash through 1990's Highwaymen 2, including 35 albums being released for the first time on CD from Columbia/Legacy and 19 early albums being released for the first time in the U.S. in mono. Each title is packaged as a mini-LP CD with its original artwork, including the five original gatefold albums in Cash’s Columbia discography. The set is accompanied by a full-color booklet that includes complete discographic information for every album: songwriters, recording dates and cities, musicians, guest performers, producers, release dates, original catalog numbers, Billboard pop and country chart numbers for albums and single tracks, and more. The Singles, Plus, a 2-CD, 55-song collection (spanning 1958-85) of single sides that did not originally appear on Johnny’s Columbia albums, ‘plus’ guest performances on other artists’ albums, among them Bob Dylan, The Carter Family, Mother Maybelle Carter, June Carter Cash, The Earl Scruggs Revue, Marty Robbins, Willie Nelson, and Shel Silverstein. Koncert V Praze, recorded at the Sport Hall in Prague in 1978, released on the Czech Supraphon label in 1983, now officially joining the U.S. catalog. Little Fauss And Big Halsy, the motorcycle racing movie starring Robert Redford, Lauren Hutton and Michael J. Pollard, with a soundtrack mixing vocal and instrumental tunes by Cash and Carl Perkins.